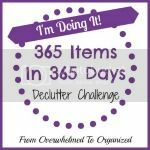 Last Thursday I shared with you that I was taking part in the 365 Items in 365 Days Decluttering Challenge. So far I’m at around 10 items, which I don’t think is too bad. Thinking about areas and items in our home that need to be decluttered made me think that it might not be a bad idea to have to a reference list of where to take/send/toss that clutter. Donation centers, recycling centers, places that will pick up at my home, locations of safe disposal sites for items like paint, oil, chemical cleaners, ect…. 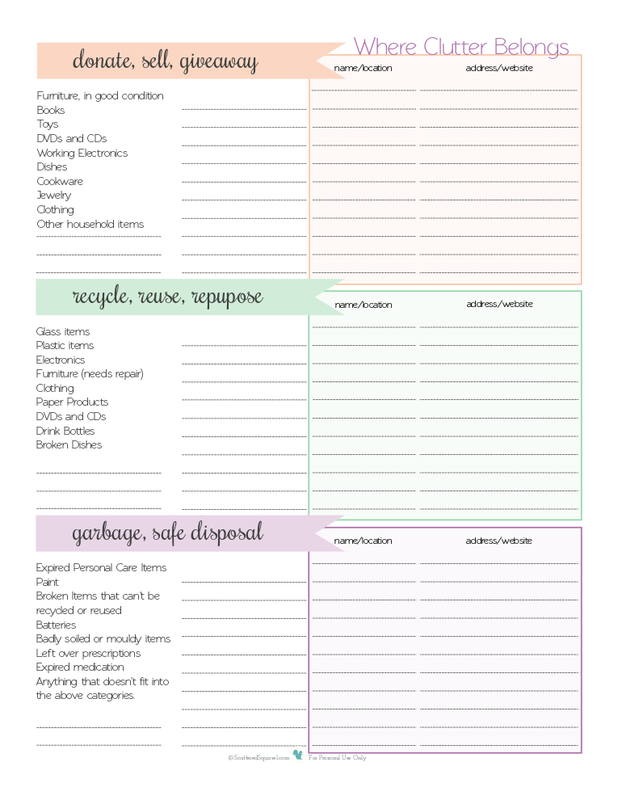 and so my “Where Clutter Belongs” printable was born. I divided the page into three categories. First the Donate, Sell, Giveaway category. I listed typical items that fall into this category and left space to add to it. The box on the right hand side is to keep track of the names and address of places to take donations, where I could sell items, and even family members or friends who might need certain items. Next is the Recycle, Reuse, Repurpose category. The rules for recycling change from one place to another, so it’s important to check with your municipality about what can and can’t be recycled. It’s also a good idea to check with your local landfill about what items they will not accept, while you’re talking to them, don’t forget to ask where those items should go. When it comes to reusing and re-purposing items, try giving your local arts center, elementary and high schools, university/college a call and see if there are any household items they need for upcoming projects. You never know, all those yogurt containers might just be needed for a school project. 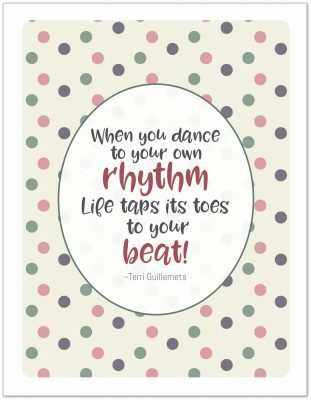 Like most of the printables I share here on the blog, I tried to keep it as simple and helpful as I could. To grab a copy for yourself simply click the photo and either a new window will open to the PDF file, or the download will start. What I’m most excited about with this one, is that I no longer have to to think about what to do with my clutter. I now have a list of places and people that I can take it all too. Decluttering can be hard enough on it’s own, anything that helps deal with the aftermath for me, is a total bonus! Does your area have any strange rules, regulations or laws about what can and can’t be recycled or garbaged? Are you taking part in the 365 Items in 365 Days Challenge? How are you doing so far?